It is fairly well established that the Titanic's clocks, when she sank, were 2 hours and 2 minutes ahead of New York, and therefore 2 hours and 58 minutes behind Greenwich Meantime. The "re-enactment" that I wrote takes its times from your computer's own clock; therefore, you could be ahead or behind the actual sinking if it were to happen in real-time. How do we circumvent this? Obviously you will have to adjust your own computer's clock, but to what time? To assist, I have modified the following map of the timezones. It is best to look at the coloured orange/pink/yellow/green/blue horizontal bars directly above the timing legend at the bottom of the map and match this up to your country, rather than looking at the vertical alternating grey-blue/white bars; sometimes the timezones don't match up. 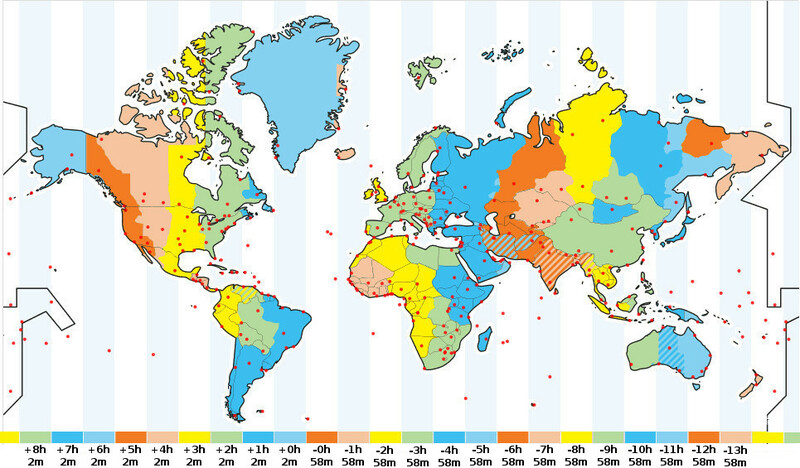 In short: this map tells you how much to change your computer clock depending on where you are. Let us provide a few examples: if you were in Los Angeles, you'd look at the map and find that you were 5 hours and 2 minutes behind the Titanic. If your computer clock originally said 6am, it would now say 11.02am. Or, say you were in Sydney, and your current time was 2pm (1400 hours) then you'd have to adjust your clock back 11 hours and 58 minutes. Your clock would now saw 2.02am for time in the North Atlantic. You will have to check with the time zones of the cross hatched areas; those in the middle east have an extra half hour included in the time zone, for instance India is +4.5 hours ahead of GMT. Since my re-enactment refreshes every few minutes, and the shortest time interval is 5 minutes, you may find adjusting your clock to the nearest hour may be a simpler option; for instance, in London, changing it to 3 hours rather than 2 hours and 58 minutes will make no appreciable difference.